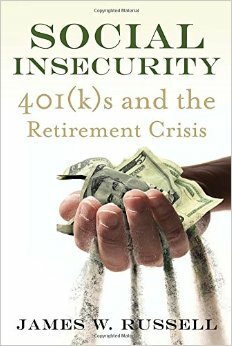 What he found out, he’s put into his explosive book, SOCIAL INSECURITY: 401(k)s and the Retirement Crisis. We spend the hour talking with Russell about 401k’s, pension plans, and social security — and what can be done to make sure we don’t end up poor in our old age. Everywhere we hear a litany of doom about the retirement crisis. Social Security is supposed to be going broke fast. Politicians from President Obama to presidential hopeful Rand Paul want it cut and privatized, at least in part. We’re told public sector pensions will bankrupt governments unless their promises to workers are abandoned. We also hear that 401k’s are supposed to be our salvation: just keep socking away the maximum allowable amount in your 401k or similar plan every year and you’ll be sitting pretty. Well, that’s what James W. Russell thought until the financial crash of 2008 took a giant bite out of his retirement nest egg. A professor of sociology at Eastern Connecticut University, he used his research skills to look into the matter more closely. What he found shocked him. The old style pension plans that have all but disappeared — called “defined benefit” plans — were way better than the “defined contribution” plans — 401k’s and the like — that have replaced them. And Social Security gives the best return of all — not just for old folks, but for their younger family members who don’t have to bankrupt themselves supporting their aged parents or grandparents. Even more, what’s happened to retirement plans since the 1980’s represents a huge transfer of wealth from workers to Wall Street. James W. Russell’s book, SOCIAL INSECURITY: 401(k)s and the Retirement Crisis (Beacon Press) is a must-read for all who expect to retire some day. In gripping and eminently readable prose, he explains why 401k’s are a bad deal, why Social Security is the best deal we have (and should be strengthened) and how to save public sector pensions. He says we need to expand Social Security, remove the cap on taxable earnings and allow people to invest in non-profit annuities. James W. Russell is an expert and activist in retirement policy. He is the author of eight books, including Social Insecurity: 401(k)s and the Retirement Crisis, Double Standard: Social Policy in Europe and the United States, and Class and Race Formation in North America. 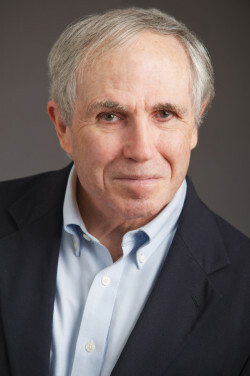 He is also the co-chairperson of the Connecticut Committee for Equity in Retirement, a rank and file advocacy group that initiated a union campaign that won the right of public employees in Connecticut to transfer from their failing 401(k) type plan to the state’s traditional pension. Very insightful program. I will make it a point to sign up for other ptograms with you. Public workers in 15 states – like my husband and I mid-career teachers in CA – are subject to the punitive GPO and WEP that reduce or eliminate our Social Security even though we contributed. This must be fixed.